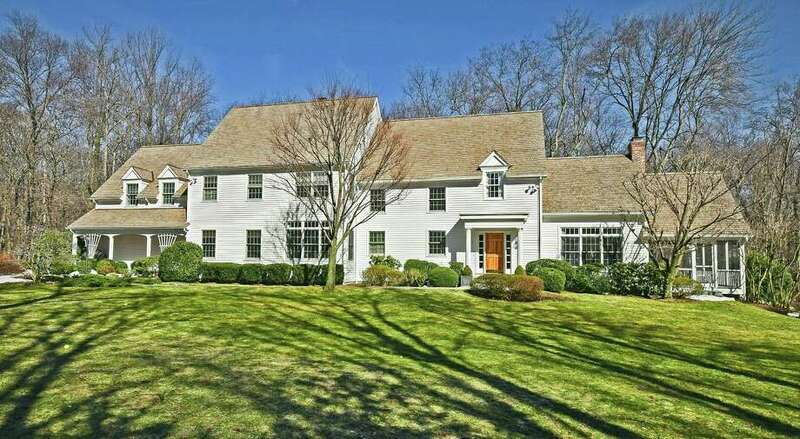 A five bedroom Colonial on Christie Hill Road offers privacy in a tranquil, park-like setting. Set back against Christie Hill down a private drive lined with stone walls, the house stands out from its woodsy backdrop. The white clapboard house with tall windows and a portico-covered entry is surrounded by professionally landscaped grounds with gardens and shrubbery. The 4,200 square foot house is set on just over an acre of land that backs up to protected open space that would easily appeal to any nature enthusiast or young explorer. But despite its nature-preserve like setting, the property is just minutes from town, I-95 and area schools. The mostly level lot offers a large, flat area perfect for play as well as a large stone terrace with a hot tub and outdoor shower. On the inside, the house offers views of its quiet surroundings in nearly every room. The house features a traditional floor plan. A paneled foyer leads to a step-down formal living room with a wood-burning marble fireplace set against a floor-to-ceiling paneled wall treatment. On either side of the fireplace are two sets of French doors, leading to a screened porch. A large formal dining room is wrapped in grass cloth wallpaper with classic chair rail and two sets of built-in cabinetry for storing serveware. The eat-in kitchen features a breakfast nook and a large curved center island for everyday seating. Appliances include a five-burner Dacor range, side by side Dacor ovens and a copper hood made in Denmark for Abbaka. Just off the kitchen is a cozy family room with a floor-to-ceiling stone wood-burning fireplace and a wall of built-ins for displaying collections. The second floor of the house has four guest bedrooms in addition to the master suite and a convenient second-floor laundry room. The largest of the four guest bedrooms could easily accommodate two beds and features a homework nook with a built-in work area and its own en suite bath. The modest-sized master bedroom features a walk-in closet, crown molding and an en suite bath with a dual vanity. A fully finished lower level could work as a family room, recreational space or playroom with a half bath and walk out access to the terrace. For more information, contact Daria Kamford of Halstead Property at 203-554-0250 or email her at dkamford@halstead.com.